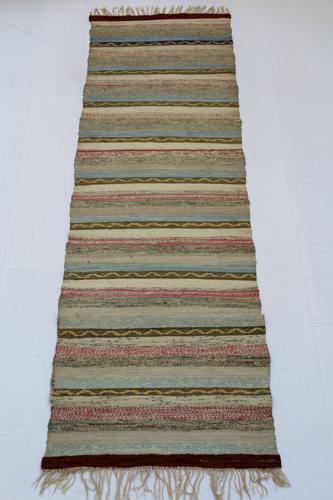 A beautiful handwoven rug with very soft, muted colours. Feature stripe is a lovely ochre wave. The rug is in overall good condition. There are two stains which I have included in the last two close up pictures. It has yet to be washed so might possibly come out. Considering it’s age, two small marks (which are not really noticeable) is not too bad. Machine washable on a 30 degree cycle.